eHealth Consortium is pleased to announce a free quarterly seminar series in 2011 for members and the public, with the aims to boost the awareness of ehealth adoption for improved care delivery. Limited seats available, REGISTER NOW! In this upcoming seminar, eHC Members and friends are welcome to join the first eHC Networking Hour which will serve as the perfect place to meet and network with likeminded industry peers to uncover answers to shared problems, make new acquaintances in the industry and source new and beneficial partnerships. The healthcare industry is faced with mounting pressures to increase quality of care and expand access to care to a growing population of aging citizens, all while acuity levels and chronic disease rates continue to rise. Patient demand continues to outstrip clinician staffing levels, while requirements for demonstrated results tighten along the critical path from care to cash. Healthcare providers in both single and multi-payer systems struggle with balancing centralized or distributed strategies for decision making and change management associated with deploying new health IT tools. These common trends are global in nature, though unique regulatory and local industry practices are shaping the spectrum of solutions being explored, piloted, and deployed. Motorola Solutions, together with its community of integration, application, and alliance partners, is focused on delivering solutions that can help healthcare providers across the continuum of care ensure they can deliver high quality care service levels in the face of these challenges. Wireless and mobility tools, combined with clinical and operational software applications optimized to be integrated into natural healthcare workflow, have been demonstrated to enhance Patient Care, improve Operational Efficiency, transform Worker Productivity and augment IT Operations. During this keynote presentation, healthcare executives from Motorola Solutions will discuss how mobile technologies are helping providers across the continuum of care rise to meet these modern day challenges, and will highlight some of the most innovative solution examples from across the world that are empowering clinicians and operational staff to transform their levels of service. Robert (Rob) Armstrong is the Global Lead for Industry Operations and Healthcare Solutions within Motorola Solutions? Global Industry Solutions Group. 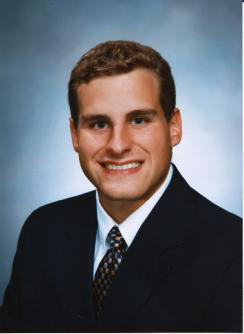 He joined Motorola in 2004, and over the past seven years has held various business development, sales operations, and product development positions across multiple businesses within Motorola in its North America, Europe, and Asia operating units. Since 2009, Rob has been responsible for Motorola Solutions? growth in Healthcare (with its first five healthcare branded products launched) and Education (whose wireless business has tripled over the last two years). Rob also leads a team of Operations professionals who are responsible for customer segmentation, sales enablement, and quantitative analysis of industry-based business performance. A graduate of the College of Engineering at the University of Notre Dame and an emeritus member of the university?s Presidential Advisory Board, Rob is also a certified Six Sigma Green Belt with demonstrated excellence in process transformation and business-critical change management and a graduate of the Speakeasy public speaking training program. Despite traveling to more than 30 countries and living in three continents over the last decade, his favorite sport remains American Football. Radio Frequency Identification (RFID) has become a very hot topic in recent years. Through ?Smart Tags?, which contain identity information about a product, people are enabled to identify and track assets wirelessly. RFID offers some distinct benefits over Automatic Identification (Auto ID) - for instance, no ?line-of-sight? requirement, improved read rates, and less labor required - thus generating significant interest in the marketplace. While Auto ID, serving a nearly identical purpose as RFID, has been widely accepted in the marketplace. Although it requires a direct line of sight rather than radio waves and requires a specific action to ?read? the bar code, it is a mature and proven technology that works well in numerous applications. What kind of Auto ID & RFID solutions are available to improve overall safety and operational efficiency at healthcare institutions? Which specific areas of a healthcare institution can benefit the most from the technologies? How ancillary facilities come together and move forward? Cantonese, supplemented with English terminologies. As founder of Ewell Hong Kong Limited, Mr. Dennis Yu maximizes development opportunities and partnerships with the healthcare sector. Dennis brings over 10 years of wealth experience in information technology solutions, security and identity verification, keeping Ewell on the forefront of modern innovation and function on healthcare solutions while successfully steers Ewell to become a pioneering company in providing a Closed-Loop Healthcare Patient Safety Solution. eHC is pleased to host the first ?Networking Hour? for our members and friends who want to meet one another to share their valuable experience, exchange their professional knowledge and discuss their products and services. It is a great way to meet people and get leads for your business. Thank you for attending the seminar. Please click here to download the presentation file in PDF format (2.12MB). 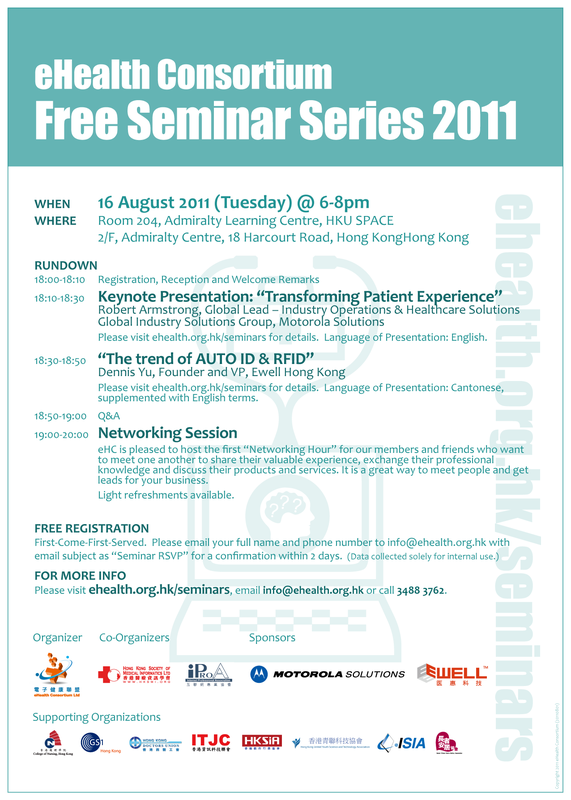 Please email your full name and phone number to info@ehealth.org.hk with email subject as ?Seminar RSVP? for a confirmation within 2 days. First-Come-First-Served. Please email info@ehealth.org.hk or call 3488 3762. Copyright (c) 2005-2016 eHealth Consortium Limited. All Rights Reserved. Website best viewed with Mozilla FireFox or Opera in 1024 x 768 screen resolution.